It is for the first time that we will see Farhan Akhtar play the role of an ATS cop in his upcoming film, Vidhu Vinod Chopra’s Wazir. 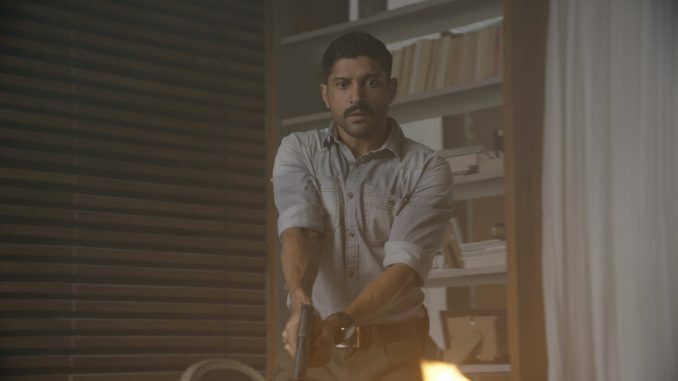 For the same, as part of his character, he has to be holding a gun which is again a first for Farhan. Surprisingly Farhan has directed super hits films, Don and Don 2, however as an actor he has never done an action film before. So, before shooting for it, the actor had to take some training to hold the gun. He needed to get the body language right. The makers had hired someone professional to train Farhan for the same as a gun is something Farhan’s character had to look most comfortable with. The actor picked up the nuances quickly and was ready to roll with the gun. His look has created a huge stir among the audiences and everyone is now eagerly waiting for the teaser trailer of the film to see Amitabh Bachchan and Farhan Akhtar in the same frame. Directed by Bejoy Nambiar, Wazir is set for release this year.